Here at AFi we are all digging this recent influx of retro-esqe, faux-vintage figures. 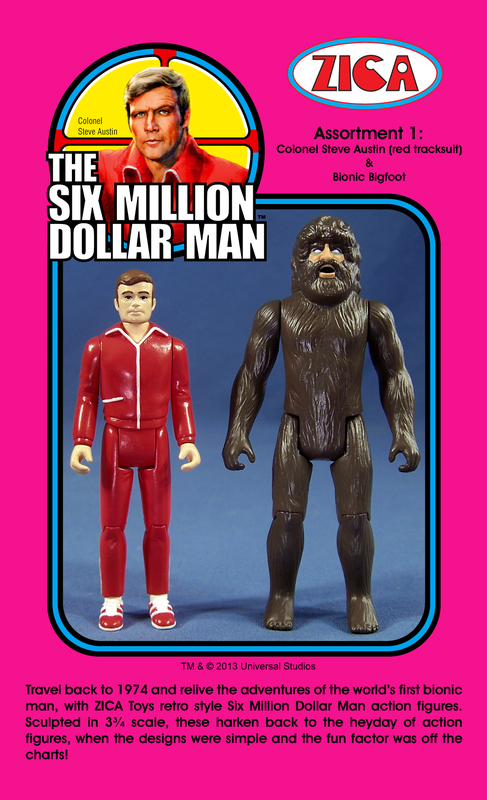 We can wait to get our hands on the Super 7 ‘Alien’ figures, we love the Gentle Giant Jumbo Kenner Star Wars figures, and we are anxiously awaiting the 3.75″ Six Million Dollar Man figures from Zica Toys. We found out that Zica won’t be attending SDCC this year so we thought since the toy world was sitting by their computers waiting for the news from preview night at comic con to start that we’d reach out to Craig and the gang at Zica to find out more information on this sweet new line. So while we are driving down to San Diego today, you can sit back and enjoy the exclusive interview with Zica toys! Action Figure Insider: What inspired you guys to go the vintage 3.75” aesthetic route when you had already established an 8” body? ZICA: Actually the 8″ body was sold in a deal with Diamond Select Toys. When they bought all of the Buck Rogers In The 25th Century tooling and extra inventory the body was part of the deal. The 3.75″ scale has always been my favorite. My first action figures were actually Johnny West and the G.I. 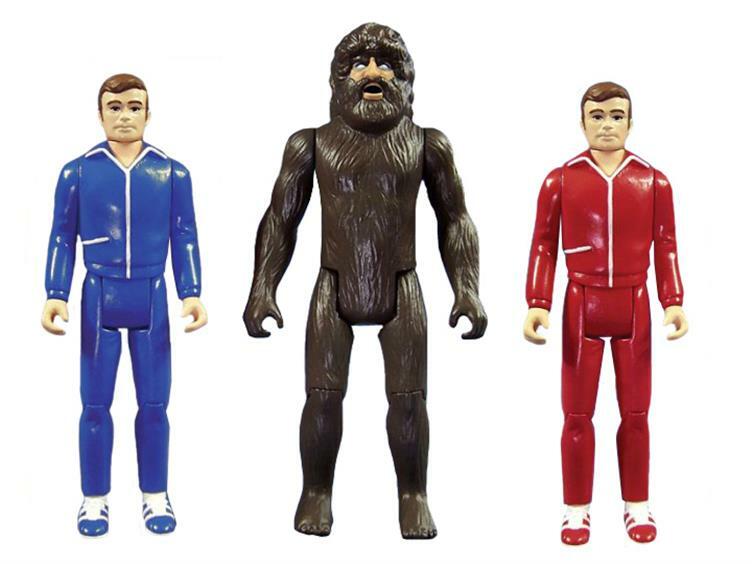 Joe Adventure Team but when I was introduced to the MEGO Comic Action heroes I was hooked. Then when the Kenner Star Wars figures were released it only added to my excitement over the smaller scale. With all of the possibilities that this scale offers in terms of vehicles and playsets, I really think it’s hard to beat when it comes to the fun factor. AFI: Do you also have the license for the Bionic Woman? ZICA: Unfortunately no. That is a separate license from the Six Million Dollar Man so an additional fee would have to be paid. AFI: If these first 2 figures do well do you have plans for a wave 2? Any character choices or wish lists you could share? ZICA: Oh yeah! If the line does well I’ve got at least 15 additional figures planned, some of which are variants. Wave 2 will include Oscar Goldman and Mr. X (Maskatron), plus another variant figure. Rudy Wells, Barney Hiller (7 Million Dollar Man) and a Fembot are also on the list of planned figures. AFI: Fans of vintage 3 3/4″ style figures almost lost their minds last summer with Super7’s ALIEN ReAction figure line reveal. 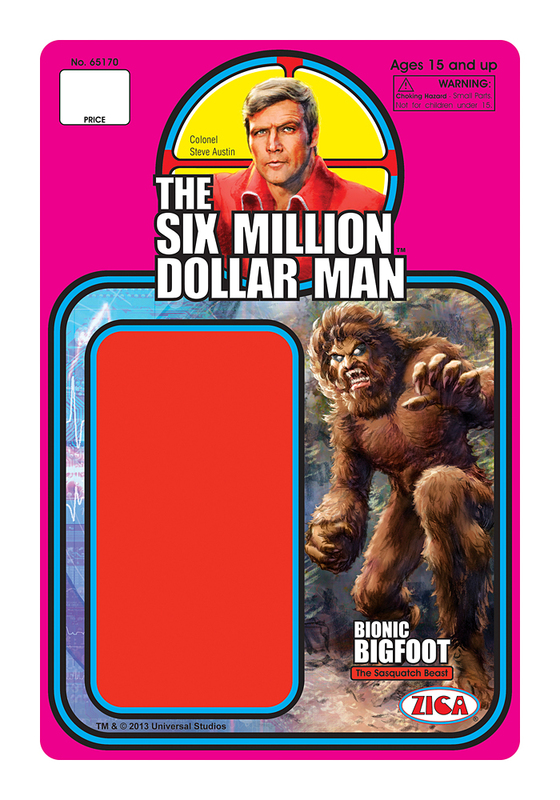 Were your Six Million Dollar Man figures already in the works or did you derive some inspiration from the Super7 project? ZICA: Actually, and this is a true story, I was already planning on doing the unreleased Alien figures. I was buying all sorts of reference material and had pictures of the uproduced Kenner prototypes. When I read the announcement online my jaw dropped to the floor. Once I knew that wasn’t an option my thoughts immediately went to the SMDM. I was a huge fan of the show and had most of the toys as a kid. 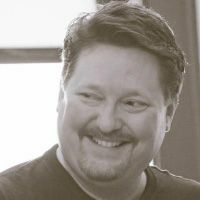 Once I decided on this property I took a gamble and went ahead with having the prototypes made, even though I had no idea if the license was available or not. Luckily that gamble paid off and I got the opportunity to make the figures. 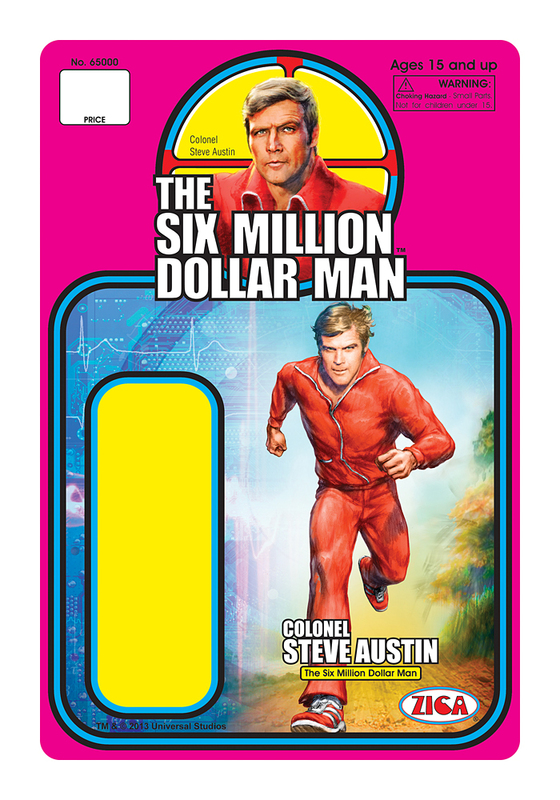 AFI: If the Six Million Dollar Man figures are successful, you’ve mentioned that we could see vehicles and play sets. Awesome! Any plans for creating figures in this style for other properties? If so, are you just focused on old-school properties? ZICA: Yes, definitely! Old school properties are my favorite but if a modern property looks like it would work in the scale and style I would gladly take a shot at it. ZICA: Actually no, it wasn’t. I thought that Bif Bang Pow would have the license for this particular scale but as luck would have it that wasn’t the case. Working with NBCUniversal has been a pleasure and I’m extremely glad they were willing to give me a chance with this property. AFI: Online retailer reorders are up. Any further word on whether or not these will eventually be available at TRU or other mass retailers? AFI: Which vintage action figure lines were your favorites? Any lines you wish hadn’t have ended when they did? Which vintage properties should’ve had figures but didn’t? ZICA: Yes, I was aware of those figures even before I got the idea to do the line I’m working on now. At first I was considering simply recreating those but after a lot of discussion with my sculptor I decided it would be best to start from scratch. So far it seems like that was a good decision because the feedback I’ve gotten has been extremely positive, and this was even after I showed the unproduced Kenner SMDM figures. ZICA: I definitely have plans for other license in this vintage style, including modern licenses. So far it seems like there’s a fairly large market for these type of figures and I’ll be happy to make them for as long as I can. AFI: Do you see these as ongoing lines, or limited runs for each license? ZICA: As long as people are buying the figures my plans are to keep the lines ongoing. AFI: We’ve seen 2 versions of the jogging suit Steve Austin a red version and a blue version. Will there be any difference in the card art for the 2 versions? ZICA: The blue version of Steve Austin in the jogging suit will actually come in a small white mailer box, similar to what Kenner did with their promotional figures. Each wave will have a variant figure that will be packaged like this, and for wave 1 it’s the Steve Austin in blue jogging suit. AFI: Any other variants planned for the line? ZICA: Yes, each wave will have a variant figure which will only be revealed when the figures are listed for pre-orders. AFI: At any point in the process of securing the license, getting this sculpted and having the produced did you ever make the bionic sound effect (ch-ch-ch-ch-ch-ch-ch) with your mouth? Thanks to Craig from ZICA for answering all our questions. 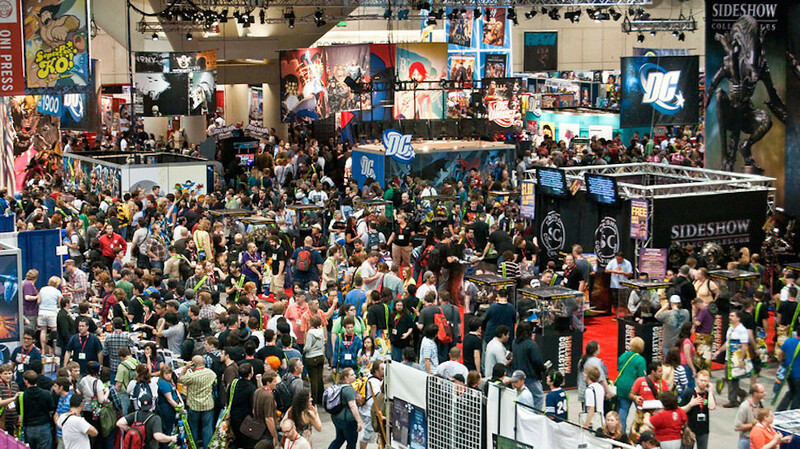 Stay tuned for all our Comic Con Coverage starting this afternoon on AFi!